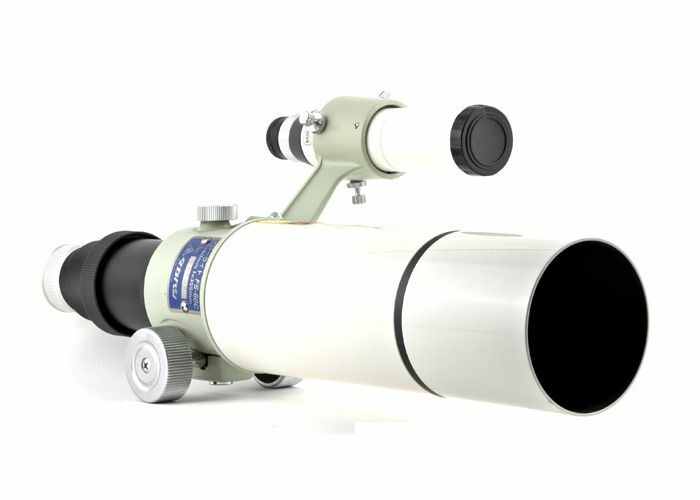 This compact Takahashi refractor optical tube makes an ideal eclipse scope and a super travel and backyard scope for spur-of-the-moment observing. It uses a 60mm f/5.9 fast focal ratio air-spaced doublet optical system. The front element is a laboratory-grown calcium fluorite crystal lens with hard multicoatings for maximum light transmission. The rear element is hard multicoated low dispersion flint glass. The combination of fluorite crystal and low dispersion glass provide absolutely superb apochromatic color correction that is visibly better than any ED glass doublet scope. Color correction is on a par with far more costly triplet systems, but the light transmission is higher than any triplet apochromatic system, due to the smaller number of optical elements to scatter and absorb light. This Takahashi optical tube uses a series of internal knife-edge baffles to block stray off-axis light for the highest possible image contrast. For more details, click on the “Takahashi fluorite lens” icon above. Experienced observers sometimes report that the scope’s high contrast/diffraction-limited optics can be used at magnifications of over 100x per inch of aperture on suitably bright objects (the Moon and planets) on nights of exceptional seeing. Of course, we can’t guarantee you’ll be able to reach this kind of magnification level with any sort of regularity with this Takahashi (it would take the equivalent of a 1.5mm eyepiece and would produce a very dim 0.25mm exit pupil), but the possibility of very high magnification is there. The smooth Takahashi rack and pinion focuser has large ribbed focusing knobs that are easy to grip and operate in cold weather, even when wearing gloves. The optical tube has a flat boss above the focusing knobs, with two mounting bolts to hold an optional finderscope, such as the straight-through Takahashi 5 x 25mm with its very wide 9° field. The supplied 1.25” eyepiece holder uses a non-marring nylon split compression ring system to hold your star diagonal or eyepiece in place. This system won’t scratch the barrel of your eyepiece or star diagonal, as an ordinary brass or steel thumbscrew can. A simple twist of the ribbed ring at the end of the focuser drawtube tightens the internal compression ring to hold your diagonal firmly in place; while a twist in the opposite direction lets you remove it with ease. The Takahashi optical tube itself weighs less than three lbs. It measures only 17” long with dew shield in place. 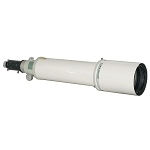 The optical tube is 80mm in diameter and an optional tube holder is available to fit the scope on a Takahashi mount (such as the altazimuth #TGS01 or the very compact #TGUL Teegul Sky Patrol equatorial). The 60mm Takahashi FS-60C. Expensive for a 60mm optical tube? Yes. Worth it? Emphatically yes.